The Stage view can be used to position elements as well as the camera within the stage for each of your scene. When working on 2D scenes, the Stage view has the same functionality as the Camera view. However, if you are working on a 3D scene, the Stage view allows you to view the stage from any point of view in the 3D space, whereas the Camera view always displays the stage from the point of view of the Camera lens. For more information, see Camera View. NOTE A status bar is located at the bottom of the Stage and Camera views, which contain toggle buttons to hide and display different kind of indicators as well as to adjust the zoom level of the view. TIP You can hide the status bar in the Stage view by opening the Preferences dialog, selecting the Camera tab and disabling the Show Status Bar option. In a view area, click the Add View button and select Stage. You can also select View > Grid > Show Grid or press Ctrl + G (Windows) or ⌘ + G (Mac OS X)—see About Drawing . NOTE You can select the Action Safe Area Mask option by clicking and holding the Action Safe Area button and selecting it from the pop-up menu. NOTE You can select the Title Safe Area Mask option by clicking and holding the Title Safe Area button and selecting it from the pop-up menu. Displays the timecode of the current frame in the top-left corner of the view. The timecode is displayed in the HH:MM:SS:FF format, where HH means hours, MM means minutes, SS means seconds and FF means frames. Shows or hides the IN and OUT indications in the top-left corner of the camera frames, on the start and end position of a camera move for the current panel. When the Camera tool is selected, the labels switch to alphabetical labels that clearly show the different camera keyframes—see About the Camera. NOTE This option is not available in Camera by Panel Compatability mode. You can also select View > Reset View or press Shift + M.
NOTE This option works with the Stage View. You can also select View > Reset Rotation or press Shift + X. NOTE This option is used when working in 3D space—seeAbout 3D Objects. Displays the currently selected colour in the Colour View . You can click the colour swatch to open the Colour view and select a new colour. 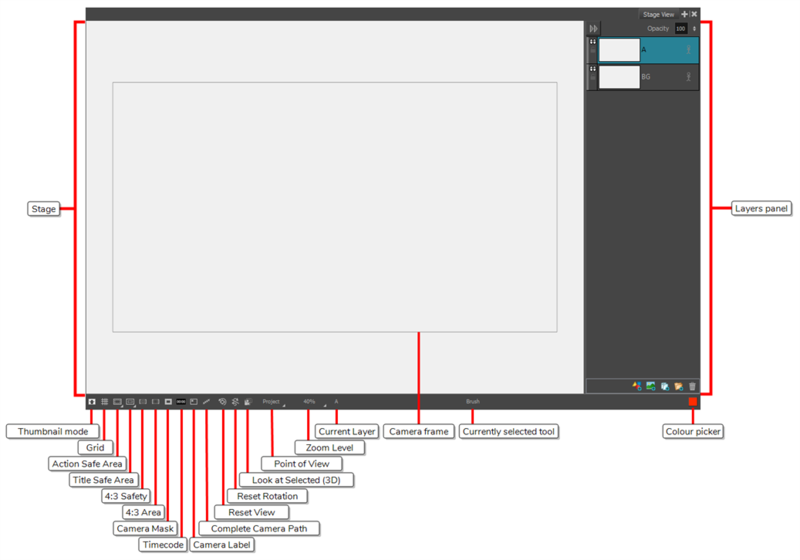 The Layer panel is where a scene’s layers are superposed to form the final image. When you import an image or draw in a panel, you are actually adding artwork to one of its layers. By default, each panel has two layers; a background layer (BG) and a foreground layer (A). As you add layers, they are automatically assigned subsequent letters in alphabetical order, but you can rename them. 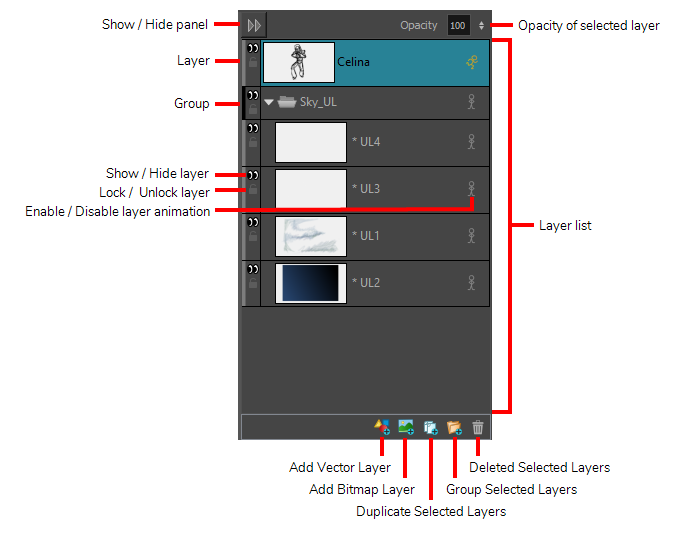 They are also placed on top of the selected layer or at the very top of other layers if there is no layer selected in the panel. Groups selected layers. The grouped layer is named Group and appended with an underscore and a number. For example, Group_1. Each time you creat a group, the number is incremented.